Tournament admins can ask for, or require, certain connections (like following their Twitch channel) in tournament registration. Tournament admins on smash.gg can ask for, or require, a certain connection for competing in their tournaments on the tournament level or on the event level. Note: these are available both as REQUIRED and as OPTIONAL. If you set one to REQUIRED then a player will be unable to register for that tournament (or specific event, depending on where you configured it) without completing the connection. If you set one to OPTIONAL then they may choose to complete it, or not, when they register. To ask for/require a connection from players registering for any part in your tournament, go to the Registration Settings page of your tournament admin. To ask for/require a connection from players registering to compete in a specific event in your tournament, go to the Registration Settings page of your tournament admin. In the Events section of the Registration Settings page, click 'edit' on the event you want to require a connection for. Once you're in the Require Social Connections section, either on the tournament or event level, you can configure the connection you want. 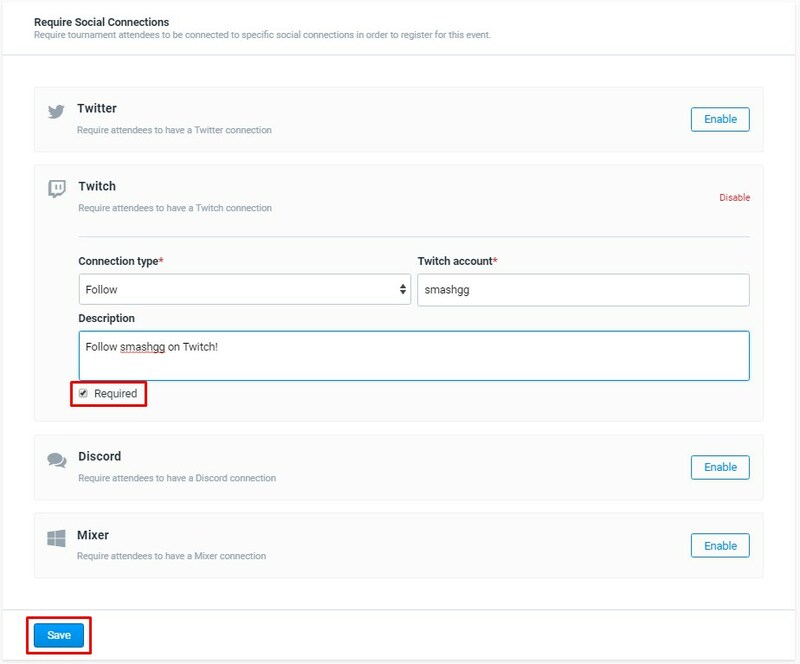 For certain connections, you can also choose the type (like 'follow' or 'subscription' for a Twitch channel) and which channel/server it's for. Use the "Required" checkbox to choose between making a connection REQUIRED or OPTIONAL. Checked for REQUIRED, unchecked for OPTIONAL. 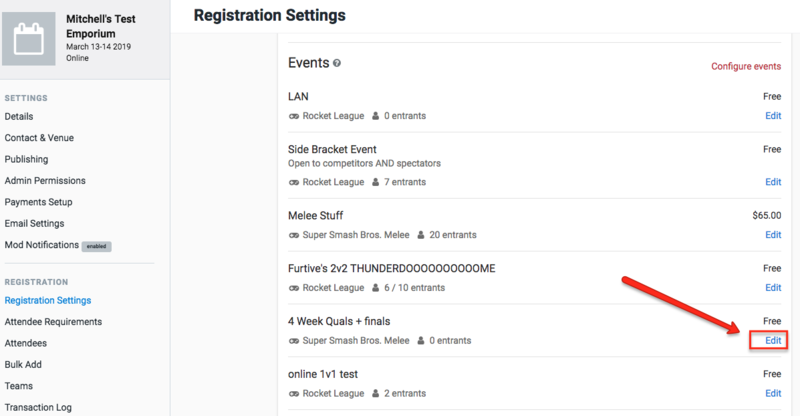 Once you click 'Save', anyone who registers for your tournament (or the specific event, if you are setting an event-level connection) will be asked, or required, to have this connection before completing registration. 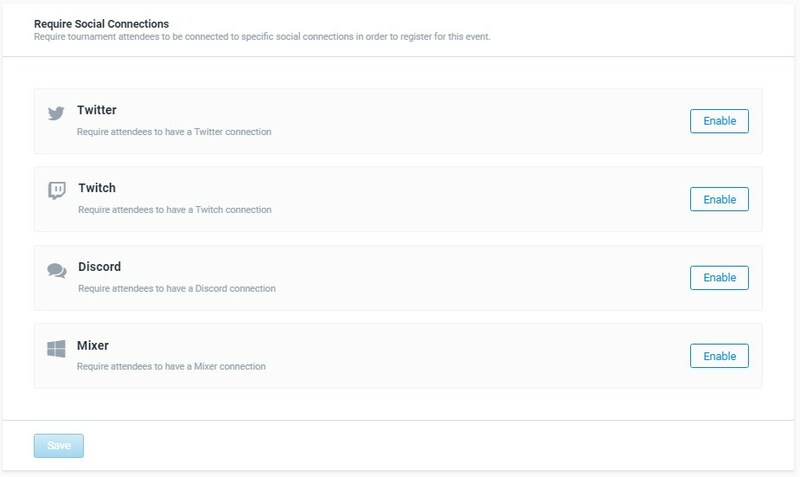 You can view the Twitch, Twitter, StreamMe, or Discord usernames in the Attendee Export for players who have completed these connections while registering for your tournament (available from the admin Attendees page).